For some of you, it may be your first time in the courtroom. You will notice three officials in the courtroom at all times. These officials are the bailiff, the clerk of court, and the judge, who has on the black robe. The bailiff is a law enforcement officer wearing a gun, and his primary duty is to protect the judge along with the decorum of the courtroom. The clerk of court assigned to the courtroom is the official record keeper and runs the transcription equipment and receives exhibits. The judge is easy to identify, as that is the person in the black robe. The judge is in charge of the courtroom. You will notice that there is a “bar” separating the spectator section of a courtroom. 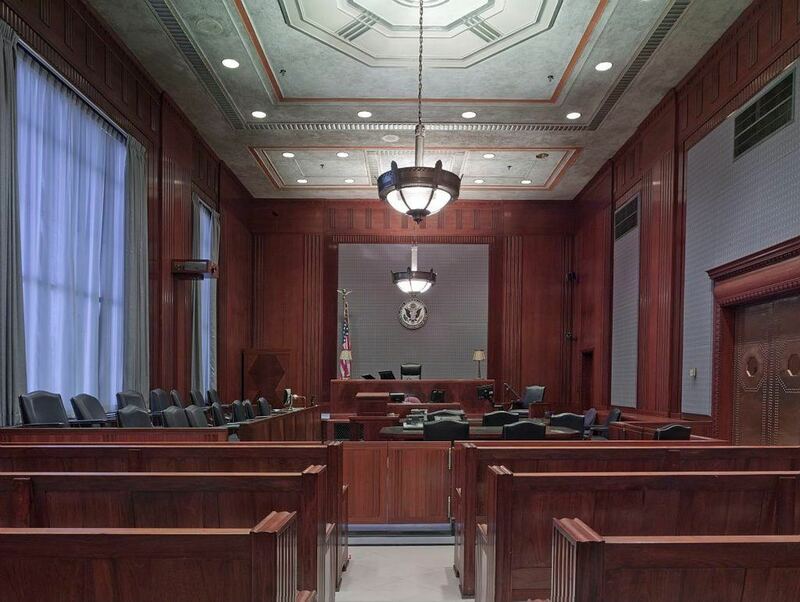 The “bar” section is the front section of the courtroom containing the following: (1) part of the courtroom where the jury might be seated in a jury trial; (2) the two counsel table—one for each side; (3) the bailiff; (4) the clerk of court; (5) the judge. You, as a witness or a spectator, cannot go outside of the spectator section without permission of an official of the court. Do not try to go to the front of the courtroom. If you are the client and a party in the lawsuit, your lawyer will instruct you when to move to sit beside your lawyer at counsel table. Do not talk to your lawyer generally while sitting beside your lawyer in court, although you may take notes and hand your lawyer notes. There is a recording device right in front of you, and your conversation with your lawyer could be inadvertently intercepted. You cannot talk. You cannot answer questions. Questions can only be answered by the witness on the witness stand who is answering under oath or affirmation. You cannot help a witness answer a question. You cannot make hand signals. You cannot make faces. Your face needs to remain neutral. You cannot shake your head. You cannot chew gum. You cannot have liquids. If you need to have something to drink, most courthouses have a break room. Go there. If you need to have a conversation, exit the courtroom and have the discussion in the hallway as you will not be permitted to talk in the courtroom and be disruptive. Coming to a courtroom in a family law matter sometimes seems like a wedding. There is a bride’s side of the courtroom and a groom’s side of the courtroom. Witnesses supporting one side seem to sit together. While that might be understandable, you should not seem like you are so anti one side or pro the other side at the risk of making a bad impression on the judge. This would be particularly true in a custody trial, where a child who is the subject of a custody trial needs as many people in his life to love as possible. Keep in mind that the judge is going to not see your hostility toward the other side as a favorable reaction (and probably not best for the child). What can I bring to the courtroom? What to wear to a courtroom? You should dress in layers. It may be cold; it may be hot, and the temperature may vary throughout the day. If you are in doubt, wear what you might wear to church. You’re not going to be able to bring your cellphone to the courtroom or a computer to the courtroom without special permission. That permission will only be granted by the judge if the phone or the computer is needed as evidence in the case. And, the attorney has to ask the judge for permission. If your phone and computer are not required as evidence in the case, you must leave it either in a locker provided at the courthouse near the security station, or at an attorney’s office, or at your home or car. You might bring a little cash with you for the vending machines in the courthouse break room. Also, there usually is a lunch break in most courtrooms between 12:30 and two every day. Arrive in time to clear the security stations before the designated hearing time. There are certain days at the courthouse that security can take as much as 30 minutes to get through. The process is one of respect. Please be respectful as this is necessary to our system of justice. It is a process. Have fun with your day in court. Listen attentively. Learn as much as you can. Enjoy, and hopefully, it will be an excellent experience for you!